After Jason Megna received 4 penalties last night against the Calgary Flames, he was sent back down to Wilkes-Barre. Also, Zach Sill has an "upper body" injury and is expected to miss a few weeks. 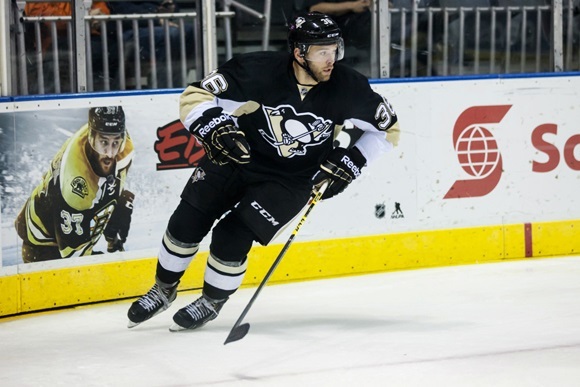 As replacements, the Pens have recalled forwards Bryan Rust and Bobby Farnham. Both right wingers; Rust is a right-handed shot while Farnham is left-handed. Rust was a 3rd round draft pick of the Pens back in 2010. He played for 4 years at Notre Dame, where he scored 97 points in 161 games. Last season, Rust appeared in only 3 games for the Baby Pens, one of which was a playoff game. He didn't register a point. This season, Rust has 10 goals and 4 assists in 25 games for Wilkes-Barre. Rust plays a high motor game that allows him to be effective in many different assignments all over the ice. He has excellent hockey sense but is not an overly creative forward, meaning he will produce offense but it will be through hardwork, playing to his strengths, and of course having complementary linemates. He rarely takes a penalty or makes a mistake on the ice and consequentially is often deployed when the game is on the line. His bread and butter is on the penalty kill, but he looks more than comfortable on the powerplay as well. Farnham, a 2013 free agent signing, played college hockey for Brown University where he had 54 points in 129 games. He improved his point totals every year there. Over the last 2 seasons for Wilkes-Barre, Farnham had 25 points also in 129 games. This season, he has 1 goal and 3 assists in 23 games. He also has 113 penalty minutes. Farnham will play for one of the Penguins minor league affiliates in 2013-14. He projects as a pesky energy player who can drop the gloves and take a regular shift on the fourth line. Seems like these two are the perfect replacements for the likes of Megna and Sill. Both are expected to make their NHL debut tonight against the Columbus Blue Jackets.